Why Small Businesses & Stores Also Deserve A Website? Your business’s online presence starts and ends with a website. Social media pages are not enough to grow your business, they should only be used for directing others to your homepage and for promoting your products. Whether you bring your business online or you simply start a static website showing details of your business, in both cases you create an online property which grows your business and becomes another source of income at the same time. We have heard many business men saying that they own a small scale business/shop and they are the only one who work for it and don’t have any knowledge on managing a website and they are not sure whether their product can be sold online or not. So do they really need a website? The answer is ofcourse you need a website. If you own a business, you should own a business website too. There’s nothing which cannot be sold online. We are not suggesting you to put all your time and efforts in selling your products online, the point is to be present online with a professional looking website so that more people can find you in search results, recognize you and come to you for making purchases. Now-a-days many people search for information online prior to making purchases from anywhere (For Example: Best mobile stores in ____ area or car showrooms in ____ city etc) . Hence if you have a professional looking website, it will help you leaving a good impression on a potential buyer. Many tourists and the foreigners expect to be able to find your business website on world wide web. Whether you are selling anything online or simply providing some information about your store/business like your contact details and location etc. Likewise in China, everyday a large amount of searches are made by tourists for finding vegetarian restaurants. Another Example: Suppose someone in a new city needs some medicines then first what he will do is search Internet for the medical stores near his location and then after finding the websites he will make phone calls to medical store owner asking where they sell those medicines or not. Hence, owning a website is almost essential. Hiring a website designer to design your website can be expensive and many a times they keep cost of domain name and website hosting separate from their main website designing fees. If you are looking for someone who can design your website with everything included even the domain name, hosting and also Facebook page design etc then fortunately there is an option. You should go for SANGKRIT.net’s Website Designing Service. For details read tutorial on How To Get Your Website Made And Managed By Dream Design Team®? If you don’t have time or you don’t have much money to hire someone to create and manage your website or whatever. Following are some product choices you can make to bring your website online. 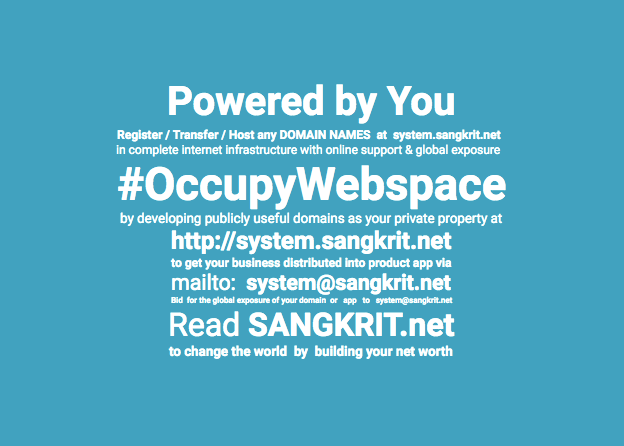 SANGKRIT.net has something for each one of you. Quick Shopping Cart® gives you everything you need to open your own online store. With Quick Shopping Cart® you don’t need any kind of technical skills to build a successful Web store. It lets you easily create an eye-catching store that accepts credit cards, integrates with Google® and eBay® and offers multiple shipping options – all with no set-up fees!. All you need to do is select a design, add your products and start selling online. Web Store Design Service is managed by Dream Design Team®, they create an e-commerce wesite for you. With Dream Design Team®, your new store will be ready in a few weeks of receiving all the necessary materials and information from you. Website Design Service is also managed by Dream Design Team® but this is for static business websites and not eCommerce webstores. You may use it if you need a static website (including About Us , Contact Us & Facebook Page Design). It includes hosting, marketing tools & thousands of website design templates and more. Web Builder, it is a fast, easy, complete and user-friendly application to create business or personal websites online. Using website builder you can beautifully create your own website, customize it in minutes. The application comes packed with all useful features to provide you everything you need to go online, grow your business and never miss a customer. Creating a website is easier than using WhatsApp and Facebook etc. Read our tutorial on How To Start Your Website/Blog? and feel free to use following comment form for any kind of assistance in designing your website. You may also contact system @ sangkrit.net. After your website is designed you can promote it via Shardul Pandey Talks program and go international, the program is open for those who register domains to create virtual wealth in web space. Previous PostSelect Ultimate Hosting To Start Your Website Designing BusinessNext PostHow To Insert Tabbed Content In WordPress Posts & Widget Areas?